The Red Pitaya is marketed as a type of digital oscilloscope, and is more accurately described as a type of digital measurement and control tool that sells for about $220 USD. However the technology behind its operation (high speed ADCs) is basically the same as what is used in a software defined radio like the RTL-SDR. 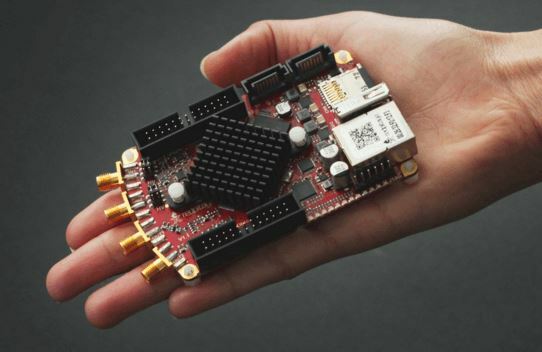 By using the correct software, and by reconfiguring it’s onboard Xilinx FPGA, the Red Pitya can be turned into an SDR transceiver. Until recently SDR projects for the Red Pitaya have been rare and so Pavel Demin decided to create his own. So far he’s managed to create a dual channel SDR transceiver that is compatible with SDR#, HDSDR, GNU Radio as well as with HPSDR. It can tune from 0 – 50 MHz with a bandwidth of up to 500 kHz, sampling with its 14-bit ADC. More information on setting the Red Pitaya up as a SDR transceiver with software like SDR# and HDSDR can be found on Pavels website. RedPitaya inputs have an impedance of 1MOhm, so direct connection to a 50 Ohm antenna system will result in very low sensitivity. A transformer or LNA with impedance matching is recommended. I agree, a one Meg-Ohm input is Noisy! At a minimum you will need impedance matching (mismatches introduce noise too) and an LNA with enough gain for your particular link analysis/budget. On Wikipedia look-up: “Friis formulas for noise”. This is about noise figure & noise temperature of a cascade. Also do a Web search for “mismatch and noise” or some-such. I don’t see a decent treatment of noise and mismatch on Wikipedia at first glance. So what are the benefits? I use now an Upconverter and Filter and LNA. hmm what does the usb dongle have? I am not so familiar with the radio stuff. February 3, 2016 - 4:10 pm e.p. If you dig around Pavel’s site you can find he has a transciever that works up to 2.5 MHz bandwidth. The ADC is really the benefit. hmm ok does it mean i plug it on an Antenna and turn SDR# on and see the Waterfall?